It's never a bad day to try water play! I LOVE water play! It’s messy, it’s noisy, the teacher will get drenched, but to me, that just means it’s going well!! I think a lot of us shy away from water and use the ‘It’s too cold yet’ excuse, but honestly, water can fit into any theme, at any time of the year. "Let them play with water, she said! It'll be fine, she said!" The best thing to do is stop making those excuses, you don’t need a wealth of resources to do water play! *If you don’t have a water tray, why not use an old baby bath? Or even just a plastic box? *If you don’t have plastic aprons, bin bags will do! *Don’t have buckets and watering cans? Who needs them?! Empty plastic bottles, tubes and tubs work just as well, if not better! 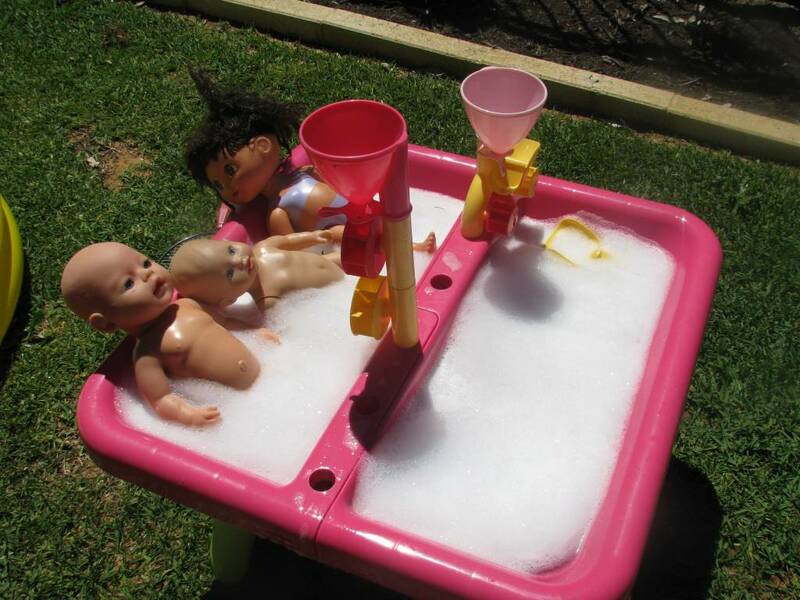 Water play doesn’t have to be all about pouring and filling and emptying! Make it interesting, give the children a task. 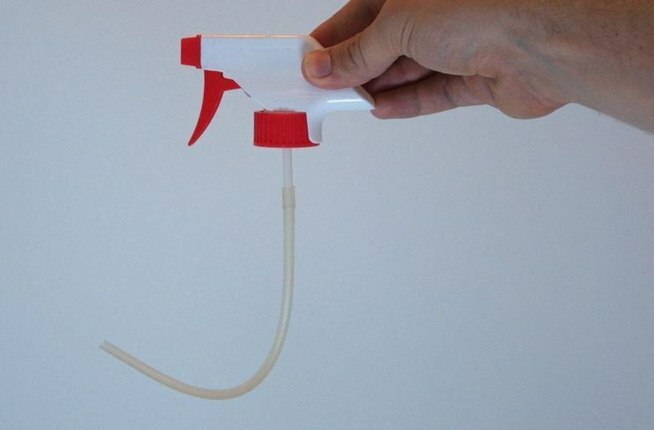 Get your hands on some *clean* bottle spray tops (or recycled – saves a lot of sterilising!) The children will have to learn about pumping the water and pointing the nozzle! They just love the idea of cleaning toys / boats or even having races by squirting the water at objects! Endless fun. Collect plastic bottle caps. Fill your water tub with lots of them and give each child at the water station a pair of those lovely plastic tweezers! While racing to pick up as many bottle caps as possible they are having a real fine-motor-finger-workout! Enter Science! Make use of that jar of coins we all have! 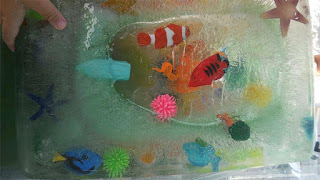 Tip it into your sandpit and get the children to fish them out with your magnets (the waterproof ones!!). The opportunities with this activity are endless – depending on what class you have! Counting, adding, sorting etc. 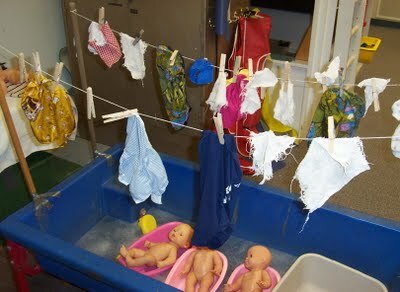 Wash some baby clothes for the dolls! Squeeze, rinse, spin, hang on the line. It’s a lovely activity. Also, don’t forget to spend a day or two washing the dolls…they have to learn about the body parts sometime! Dealz sells packets of ping pong balls for next to nothing! Write sounds / sight words on ping pong balls and have the children fish them out of the water tank with nets or ladles. Freeze some objects from the classroom; anything will do, magnetic letters, animals, counters etc. This activity speaks for itself. 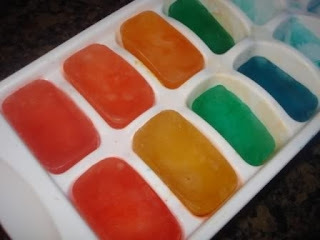 Let the children find ways to melt the ice using the water! It’s amazing how much enjoyment they take from a few ice cubes! If you’re feeling extra enthusiastic, make slabs of ice, throw in your polar bears and penguins and hey presto, it’s a polar region! Add glitter, bubbles, leaves or even a few drops of food colouring to your water! The smallest change makes such a different and increases excitement levels even more! I could be here all night if I keep going, I’ll keep some ideas for another post soon! I cannot express how wonderful www.recreate.ie is for recycled materials, and the things I picked up for water play are super! I’ll post some pictures of them soon! For more, contact me at littlemissteacherblog@gmail.com or see my Facebook Page!